Leather harnesses need diligent care to keep them from becoming brittle. High temperatures, heavy use and dirt trapped in the leather's pores causes dryness that cracks the leather. Moisturize small cracks around the edges of your harness by cleaning the leather and rubbing in conditioner. If the cracks are large, however, invest in new tack. 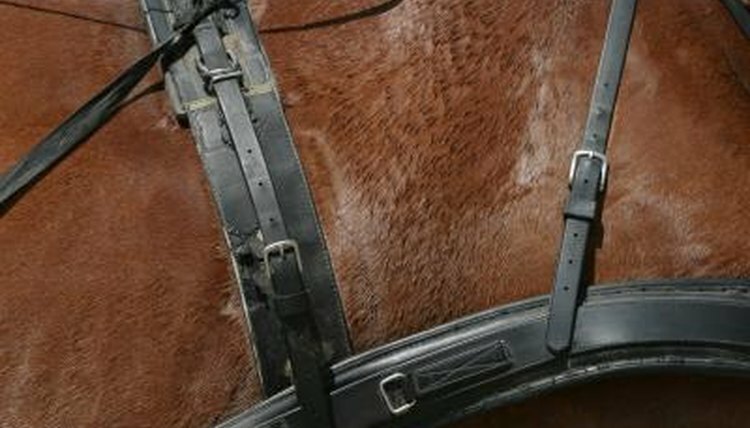 Clean the harness thoroughly by wetting a rag with hot water, dipping it into a glycerin-based leather soap or saddle soap and scrubbing the harness in small sections. Working in small sections keeps soap from drying on the leather. Scrub each soapy section with a clean rag dipped in hot water. Scrub well to remove all the grime and wipe with a wet rag to rinse. If you soap the entire harness and then rinse it, some soap is liable to dry and could damage the leather. Repeat the process of rubbing soap on the harness with a damp rag, scrubbing, and rinsing with a clean rag until the rinsing rag comes away with no dirt on it. If your harness has started to crack around the edges or has grime in places, work on a single problem area at a time. Let the leather dry, but only partially, in its natural environment -- don't set it in front of a heater or fan. Just hang it on its hook and check it every 15 minutes until it feels at least halfway dry. There's no perfect dampness; it shouldn't feel overly wet, but the edges shouldn't be so dry they're turning lighter than the still-damp center of the straps. Rub a lanolin-based leather conditioner into the harness with a dry rag while the leather is still slightly damp. Rub a little extra conditioner on cracked areas to help them regain suppleness. Continue adding conditioner and rubbing it into the harness leather with a circular motion until the leather begins to shine.  You can use neat's-foot oil as a leather conditioner; be aware it tends to darken the color of the harness. Use it only on dark brown or black leather to avoid staining lighter-colored harnesses.  Cleaning and conditioning the harness won't eliminate existing cracks, but it can keep them from opening wider or cutting deeper into the leather by keeping the leather supple. ⚠ If a crack is more than a quarter-inch long, the harness might not be safe to use. Check the harness for stitching that is coming loose near the cracked areas, and stretch and twist the cracked leather between your hands to see whether more cracks appear or whether visible ones widen considerably. If so, get a new harness instead of using one that might break under stress.